Where to Find Free Creative Commons Photos/ Pictures to Use For Blog? Yahoo announced a few days ago that it has brought back a useful image search feature- Labeled for Reuse, which allows you as a blogger to find free photos from Flickr that are available for re-use or re-posting, under Creative Commons terms. I did a test, found out that this feature is only available for Yahoo's U.S. search engine, that means make sure to go to http://images.search.yahoo.com/ directly to start your search. What does U.S. search engine mean? For example, if you are in Canada, and start your search from Yahoo's main search page at http://yahoo.com, it will be automatically redirect you to http://ca.yahoo.com page. Notice the ca. in the front of the address? that means Canada, you can do image search from there, but you will not get that Labeled for Reuse feature ! 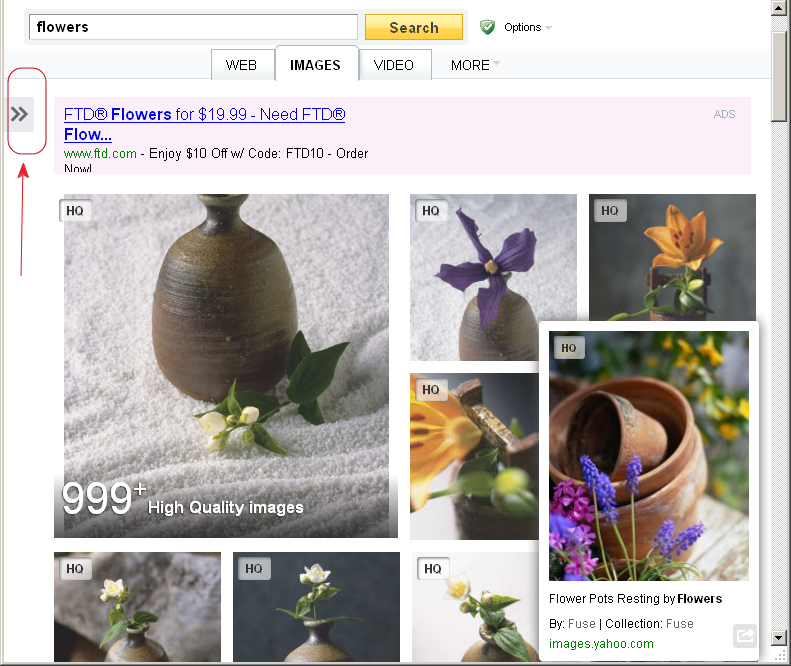 Where to find the "Labeled for Reuse" feature on Yahoo! Image Search ? It's at the bottom of left-hand menu. If you do not see the left menu at all, click on the 'open' icon at first. 4. Now, take a look at the bottom of the left-menu, see the Labeled for Reuse option? Click on that, you will see all the photos (on Flickr) that can by reused for free, under Creative Commons terms. Basically, Creative Commons means free, but may come with some additional requirements from the owner. Here are the explanations for the 4 different conditions for Creative Commons terms on Flickr: Attribution, Noncommercial, No Derivative Works, Share Alike. Attribution means, as a blogger, you are allowed to copy, distribute, display, and perform the owner's copyrighted work - and derivative works based upon it - but only if you give credit to the owner. Noncommercial means, as a blogger, you are allow to copy, distribute, display, and perform the owner's work - and derivative works based upon it - but for noncommercial purposes only. No Derivative Works means, as a blogger, you are allow to copy, distribute, display, and perform only verbatim copies of the owner's work, not derivative works based upon it. Share Alike means, as a blogger, you are allow to distribute derivative works only under a license identical to the license that governs the owner's work. You can find out free photos/ pictures on Flickr, to use for your Blog and website, by using Yahoo! 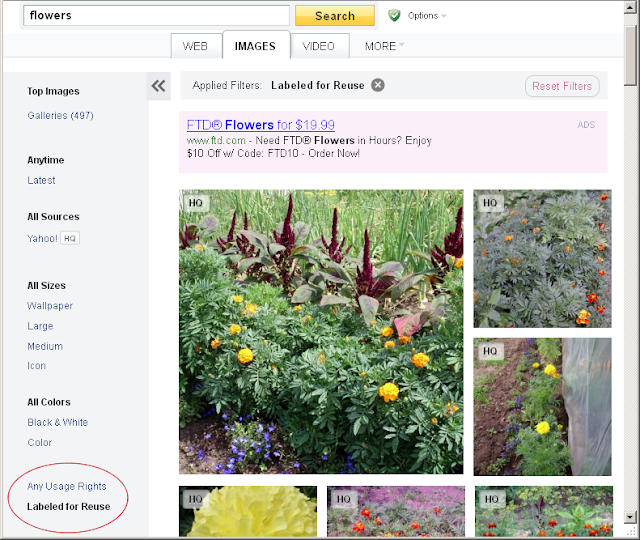 Image Search's Labeled for Reuse feature.